The Thompson Products Auto Album began almost as an accident. At the 1936/37 Great Lakes Exposition in Cleveland, a display of antique automobiles was part of the overall automotive displays. As the Expo ended, Thompson Products president Frederick C. Crawford heard that the exhibitor was going to literally junk one of the historical cars, a 1910 Duryea. 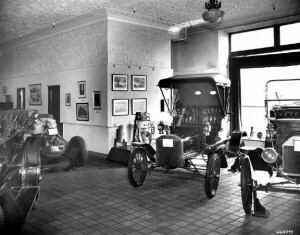 Mr. Crawford, aware of the impact of the Duryea brothers to early automotive history, had Thompson Products purchase the car, and display it in their factory. Inspired by his rescue of the Duryea, Mr. Crawford set out to try and save other early automobiles threatened with destruction. He instructed his Thompson Products salesmen to keep on the lookout for antique automobiles as they served their sales regions, and to inform him if they located anything worthy of collecting. When they would locate an interesting car, they would wire Mr. Crawford, who would authorize the purchase and shipping of the vehicle back to Cleveland. Many of these cars were found in barns and garages, and could be had for virtually nothing. After several years, Thompson Products had amassed a growing collection, and Mr. Crawford desired to display it to the public. A former Cadillac showroom was leased on East 30th and Chester Avenue, and the collection was moved there from the main plant of Thompson Products. The new museum, known as the Thompson Products Auto Album opened for business on August 13, 1943, making it one of the earliest car museums in the country. In 1944, the museum was added to, as a 7/8 scale street of shops, set in the 1890s, opened. The storefronts, which included a print shop, saloon, blacksmith shop, barber shop, and other mainstays of small-town America, proved to be quite popular from the start, and was featured in many newspapers and magazines across America. Also at that time, Thompson Products began collecting airplanes, guided by the knowledge of Charles Hubbell, the noted aviation artist. In 1945, Ruth Swihart was named curator of the museum, and she would continue in that role for the next 26 years. 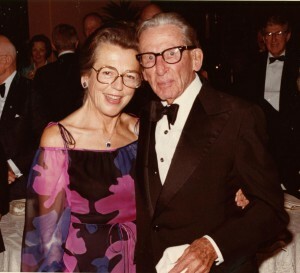 At that time, and for many years thereafter, Swihart (later Franklin, after she married), was one of the only female curators in any automotive museum or collection in the U.S. She quickly gained the respect of her male peers, and gained a nationwide reputation for her antique car knowledge She was also the first woman on the Board of Trustees for the National Antique Automobile Club of America, and she soon gained a spot in Who’s Who of American Women. By 1962, the lease was nearing expiration at East 30th and Chester, and Fred Crawford was interested in finding a new home for his renowned collection. 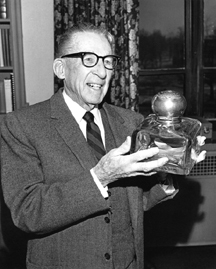 Because of his interest in and support of the Western Reserve Historical Society, Crawford felt that it would be a proper home for his collection. By 1963, the deal was set for the collection to be transferred to the Historical Society, and construction commenced in 1964. In the meantime, the Thompson Auto Album was closed so the cars could be prepared for the move. As soon as the new building was completed, many of the cars from the former Thompson Auto Album were trucked to their new home, while others came in under their own power. The new museum, named the Frederick C. Crawford Auto-Aviation Museum, opened to the public on September 11, 1965. Ruth Franklin (later Sommerlad after she remarried) coordinated the move from East 30th to the new building, and was promoted to director of the museum, a post she held until 1971, when she retired. In 1968, the Crawford Museum constructed a new street of shops, to replace the one from the old Thompson Auto Album. Frederick Coolidge Crawford was not only a Cleveland industrialist and namesake of the Crawford Auto Aviation Museum, but was also recognized worldwide for his leadership in the automotive and aviation industries, and a man who was greatly respected by his peers and his employees. In his long lifetime, he was able to experience the dawn of the automobile, the invention of the aircraft, and seeing man walk on the moon. And he played a large part in all of it. Born in Watertown, Massachusetts in 1891, Mr. Crawford was educated at Harvard, receiving a Master¹s degree in Civil Engineering in 1914. In 1916, he came to Cleveland to work at Steel Products, Co. (later renamed Thompson Products), which manufactured fittings and connectors for automobiles. He started as a Millwright¹s Helper, and began to work his way up the company¹s ladder. In 1929, Mr. Crawford became general manager of the company¹s Cleveland plant. Soon after this, he became the company¹s vice-president, and after the death of Charles Thompson in 1933, Frederick Crawford was named company president. Mr. Crawford worked to keep Thompson Products involved in the National Air Races in Cleveland, helping to organize the event and sponsoring the prestigious Thompson Trophy. Under his direction, Thompson Products increased its presence in the aviation industry, and continued to solidify its position as a major automotive component manufacturer. 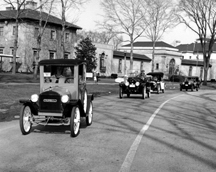 Mr. Crawford¹s interest in automobiles also directly led to the creation of the Thompson Products Auto Album, one of the first car museums in the United States, which began in 1937 with the purchase of a 1910 Duryea, a car which is still on display in the Crawford Museum. In the 1950s, Thompson Products merged with California-based Ramo Wooldridge, forming Thompson Ramo Wooldridge, later shortened to TRW. The company now had an international presence, making not only components for automobiles and aircraft, but also becoming a major player in the space industry, producing satellites and engines for lunar landers. The company remained headquartered in Cleveland until 2003. Mr. Crawford was also a major presence in Cleveland, becoming involved with many philanthropic and educational organizations, including the Western Reserve Historical Society. In 1963, Mr. Crawford had TRW donate the Thompson Products Auto Album collection to the Historical Society, which renamed the collection the Frederick C. Crawford Auto Aviation Museum. Mr. Crawford was also elected to the Business Hall of Fame, National Automotive Hall of Fame, and the National Aviation Hall of Fame; only he and Henry Ford are enshrined in all three. He died in 1994 at the age of 103. 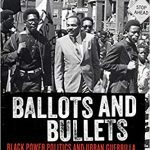 Their generosity, community leadership and love of life touched so many in Cleveland, the region and the world. The Western Reserve Historical Society is grateful for their gifts in creating and helping to sustain our Crawford Auto Aviation Museum and their generous contributions to our History Museum and Library.